Bricks: Bricks and pavers are available in a variety of colors and sizes. This variety allows you to select multiple sizes and colors to enhance the attractiveness of your project. We can work on your supplied materials for a discounted price. Natural Stone: Granite and other natural stone can also be sandblast-engraved. Granite, for example, has a natural beauty and durability that can enhance your patio or walkway. Engraved Tiles: Tiles are perfect where an inside application is preferred. They are usually only 1/2" thick and can come in 4" by 8", 2-1/2" by 8" and other sizes. The engraved tile installation is perfect where there is wall space in a visible location. Glass: There is a classic elegance to sandblasted glass. Very fine detail can be carved into this medium. 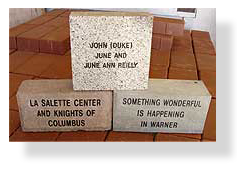 The possibilities are endless, whether doing many names on a single dedication panel, acknowledging individual room or area donations or simply giving donors a paperweight or wineglass. 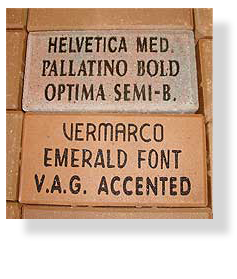 Brick and Tile Lettering: Your choice of standard lettering sizes for brick and pavers are 3/4" high (13 to 15 characters on a 8" wide brick) and 5/8" high (up to 21 characters on a 8" paver). The number of characters on a line will depend on the font chosen and the length of the paver. Since tiles are often installed near eye level smaller 1/2" lettering can be used. With any material the standard lettering color is black. We use lithochrome which is the standard for the monument industry and often used with pavers. There are other colors available for custom orders. Epoxy filling is also available. Granite and Natural Stone Lettering: paveLok will help you customize lettering for granite and natural stone, with a layout appropriate for their size. Glass Lettering: Since the glass panel size can vary, the letter sizes also can vary. If fine details or small lettering is needed, photographic stencils can be used. 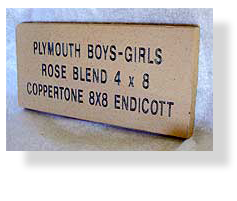 Number of Lines on Bricks: 1 or 2 lines on a 4" or 6" tall brick is standard and a 3rd line is available. Five lines are standard on an 8" by 8". However, additional lines are available if smaller height letters are chosen. With granite and natural stone usually a customized layout is used. We will provide assistance in customizing your order.